UMMS pledges to preserve St. Joseph’s Catholic identity, but how? Pending approval of its sale to University of Maryland Medical System, the ownership of St. Joseph Medical Center in Towson may change, but its Catholic identity could stay the same. At least that’s how it has been for MedStar Good Samaritan Hospital in Baltimore, according to its president Jeffrey Matton. Good Samaritan joined a non-Catholic hospital system in 1994, which merged with another system in 1998 to form MedStar. In the transitions, Good Samaritan has never questioned its Catholic identity, Matton said. “It’s trying to marry the best of those worlds in a way that is very respectful of our Catholic identity but also trying to bring the realities of positioning the organization for the future,” Matton said. St. Joseph and UMMS announced the pending sale March 23. Denver-based Catholic Health Initiatives, St. Joseph’s parent company, accepted the recommendation that day. St. Joseph is the first hospital to leave Catholic Health Initiatives to join a non-Catholic system, according to a CHI spokesperson. Although UMMS pledged to honor St. Joseph’s Catholic identity and religious heritage, the specifics of the arrangement have yet to be determined. All parties to the agreement declined to comment on what it may look like. St. Louis-based Ascension Health, which owns St. Agnes Hospital in Baltimore, was among the three finalists, along with LifeBridge Health, which owns Sinai and Northwest hospitals in Baltimore. “(St. Joseph) and its staff of outstanding doctors, nurses, physicians and other health care workers have a strong connection to the Catholic community in the archdiocese, as well as to countless others, and I pray these ties will not be severed by today’s decision,” he said. CHI and UMMS agreed to enter into negotiations, with plans to sign a non-binding letter of intent to transfer ownership of St. Joseph to UMMS within the next two weeks, according to a St. Joseph spokesperson. CHI will need to approve the transfer, as will state, federal and church authorities prior to the final transaction. The process of approving mergers and acquisitions of Catholic hospitals is unique to each bishop, said Diane Barr, the archdiocese’s chancellor, who consults on matters of canon law. The timeframe of St. Joseph’s sale will determine whether Cardinal O’Brien or Archbishop William E. Lori, who will be installed as the 16th Archbishop of Baltimore May 16, is involved in the process. At Good Samaritan, Bishop Denis J. Madden sits on the board of directors, and Cardinal O’Brien and Bishop Mitchell T. Rozanski chair and vice chair the hospital’s Thomas O’Neill Catholic Health Care Fund. Having archdiocesan leadership on the board is part of its Catholic identity, Matton said. The hospital’s Catholic identify is also written into its bylaws. The hospital employs a priest full time to oversee its pastoral care department. It has a chapel with daily Mass, a strong chaplaincy program, and crucifixes in all of its care areas. It follows the U.S. bishops’ directives for Catholic health care services, and its Catholicity continues to distinguish it from other MedStar hospitals, Matton said. An enduring Catholic identity hasn’t been the case with all hospitals that have joined with non-Catholic hospitals. Sacred Heart Hospital in Cumberland teamed with Memorial Hospital in the 1990s. Both hospitals were demolished and replaced with Western Maryland Regional Medical System, a non-Catholic hospital. The Sisters of St. Francis of Philadelphia began St. Joseph’s in 1864 in three donated row houses on North Caroline Street in Baltimore. Formally incorporated in 1870, the hospital grew while responding to the community’s needs, as it did when it established a school of nursing to meet professional shortages in 1901 and established the Heart Institute in 1995. St. Joseph Hospital moved from Baltimore to a new facility in Towson in 1965, and in 1996 became St. Joseph Medical Center to recognize its comprehensive clinical services. In that same year, Aston, Pa.-based Franciscan Health System, which included St. Joseph, joined with two other national Catholic health systems to create CHI. Additional hospitals and systems have joined since its founding, and today, CHI has 76 hospitals, as well as long-term care and other facilities in 19 states. In the past several years, CHI has transferred ownership of four hospitals to two other Catholic health care systems. 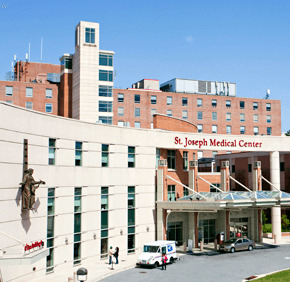 St. Joseph began seeking proposals to form a new “strategic relationship” from Maryland hospitals in October 2011. Some hoped that St. Joseph would align itself with St. Agnes Hospital, with which St. Joseph formed Mission Health Partners in 2007 to support the hospitals’ partnerships. On April 2, St. Agnes announced that it was launching The Hodes Liver and Pancreas Center, which began at St. Joseph and will now offer services at both hospitals. In his March 23 statement, Cardinal O’Brien committed the Archdiocese of Baltimore to “doing everything possible” to ensure the hospital continues “to reflect the values that have been the hallmark of St. Joseph’s for nearly 150 years: reverence, integrity, compassion and excellence” – citing CHI’s core values. Those values were called into question in 2009 with allegations that the hospital’s former chief of cardiology Dr. Mark Midei had implanted coronary stents in hundreds of patients unnecessarily. St. Joseph faced lawsuits from Midei’s former patients, as well as a federal suit charging the hospital with paying kickbacks to MidAtlantic Cardiovascular Associates – where Midei was a partner before joining St. Joseph – in return for MACVA’s referrals to St. Joseph for lucrative cardiovascular procedures. St. Joseph agreed to pay $22 million to settle the federal claims in 2010, but denied liability. In its statement accepting the recommendation, CHI called health care providers joining “geographically proximate” regional networks “critical” as health care evolves. CHI’s network includes hospitals in 19 states, including some in Pennsylvania that, like St. Joseph, were founded by the Sisters of St. Francis of Philadelphia. CHI operates within regional systems in its nationwide network. UMMS currently has 12 member hospitals, including the University of Maryland Medical Center in downtown Baltimore. It has shared affiliation agreements with St. Joseph in the past, mainly for educational or clinical services. “As sponsor of the St. Joseph [Medical Center], CHI is committed to ensuring that the hospital has a new owner that would continue the organization’s mission of creating healthier communities and providing the best care possible for its patients,” a CHI spokesperson said.